Well the here is the final review not only of the final deal, but also the work that Arrington Engines does overall. 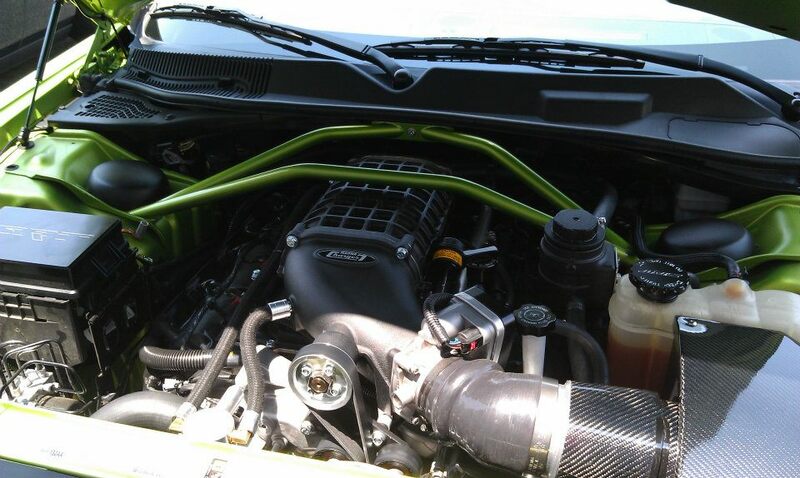 This was done on a 2011 Challenger and included their PCM swap. You can see the full kit details in my initial post. First off I have to say WOW! This thing was fun before the work was done, but now it’s just INSANE fun. Really you just cannot help mashing the gas pedal to feel that power under the hood. The work was complete the week of July 4th and I flew down to pick it up. I flew into Greensboro, NC and Alex Jones, the sales guy was kind enough to pick me up and bring me back to the shop. It’s about an hour drive and at least he had a nice SRT8 jeep to travel back in. Once we got there it had just come off the dyno for final tuning and needed a quick oil change and a couple small things done to it. They had left off the Petty Strut Tower brace due to a clearance issue. I was pretty upset about it, long story but I am really attached to that part. Alex talked to the shop manager and assured me it would be on before I left. We grabbed a bite to eat and he gave me a shop tour of the place. This place is just COOL. They had NASCAR race heads in the machine shop, engine blocks everywhere, various cars in different stages of builds. Just a fun place to hang out for a couple of hours. Finally she was done, and Alex and I were ready for a test drive. Mind you it was 5 weeks since I last drive it, and by this time there was a new Clutch installed that took a bit of getting used to. NO, I did not stall it as Alex though I would, but it was quite a bit heavier. From the first snap you could hear that distinct supercharger sound, but it’s not even noticeable at idle. I love that since it makes it more of a sleeper. You cannot hear the screws until you wind it up and really get on it, but when you do…..hold on for dear life! Thank heaven for those Brembo brakes….you will need them. Once we test drove and everything was good, I set off for the 12 hour drive home. Throughout a few spots I was able to break her open to 110ish very easily. Problem was, being the end of July 4th there was a LOT of police out so I wanted to make it home without any tickets. What I can say is the workmanship, and professionalism at Arrington is BAR NONE, the best. I would say they are the place to get your HEMI worked on without a doubt. I may even send mine back in the spring for some heads and a cam, just to break the 600 mark. The reason I like these guys is you cannot even tell the motor was dropped from the car. It’s like they were never in there. The final fit and finish is great. Aside of a couple small things that I saw but are not functionally a problem things are great. Mainly the intercooler sets on a slight angle I think for some clearance issues with the Radar Detector Laser Shifters. Also when those were re-installed they are not placed per the recommendations. Not a big deal frankly I can have those adjusted when it goes back for heads and a cam. I will say yesterday I did have ONE small issue. If you have this done check the vacuum hose from the brake booster to the intake. When they installed it they used a plastic “T” fitting that actually failed while I was driving. I lost power brakes but could still muscle it to a stop. I got a single length of hose and ran that without a “T” from booster to intake, and it’s back to normal. I asked them for future builds to dump that fitting and just toss a new length of hose on there. Seems cleaner and won’t fail like mine did. That’s been the ONLY issue so far ans was resolved with a quick phone call to the shop to diagnose over the phone. 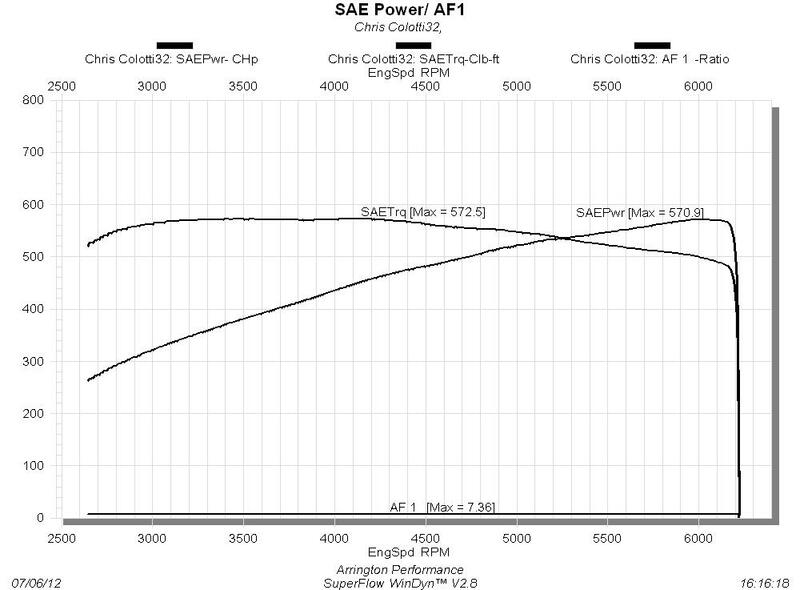 In the end the stock dyno was 408rwhp and it went to 570rwhp. Below is the official dyno sheet from the last tuning run so you can see for yourself. hotttt. Thanks for the detailed write-up and pics!